If you'll forgive the pun, Tectonics has marked a real shift in the way orchestral music is perceived in Scotland. While modern composition and experimental music have much in common, it was, until recently, quite rare for a Scottish orchestra to share a bill with, say, a noise musician or improvising saxophonist. The great achievement of Tectonics has been to bring all this together in a way that feels organic and exciting. Of all three Glasgow Tectonics to date, this year's seems to have been the most accessible and relaxed. It's not that curators Ilan Volkov and Alasdair Campbell have compromised artistically – there is no shortage of 'difficult' music on offer – but there's a quiet confidence to the programming that reflects their faith in the audience's receptiveness to new music. It's also worth noting the festival's better-than-average gender balance. 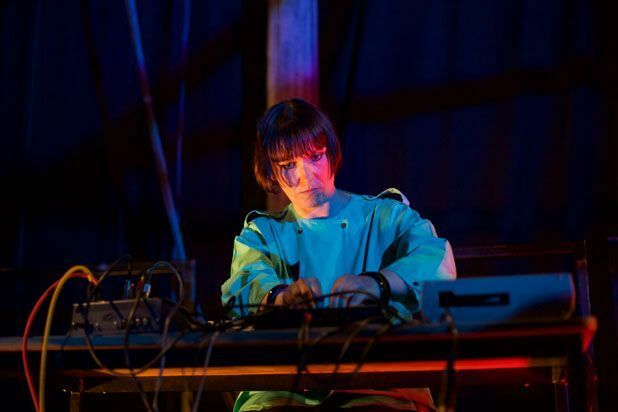 Experimental music festivals can be overwhelmingly male affairs, so the strong representation of female performers and composers is a welcome move. Glasgow artist Julia Scott makes a powerful feminist statement during her Saturday evening set by asking the men to leave the space. That a number stay put says a lot about male privilege in experimental music circles. The festival opens with a new piece by turntablist Mariam Rezaei and Glasgow Improvisers Orchestra. The first of this weekend's artists to make inspired use of the Fruitmarket space, Rezaei has members of GIO and the BBC Scottish Symphony Orchestra lined up along the balcony, where they play in response to a mesmeric video of psychedelic abstractions and laconic text. Moving around the space is the best way to hear the shifting mass of sound which emerges from the initial drone. Not being able to see exactly where the sounds are coming from adds to the experience: jabbing strings, wordless soprano vocals and prickly guitars swoop down from the balcony, while a barrage of percussion thunders from the back of the room. A tabletop set from Karen Constance and Adam Bohman conjures haunted house creaks and occult lullabies, while the great Peter Brötzmann steals the show with a stunning solo reeds set. Switching between tenor and soprano saxophones and the Hungarian tárogató (a ruder, raspier clarinet) the German free-jazz legend is on richly expressive form, moving from slow burning balladry to wispy multiphonic flights. He's followed by Justin K Broadrick of industrial metal pioneers Godflesh, grinding his booty as he coaxes sensual low-end feedback from an 8-string guitar and two Orange amps. Saturday brings the first of two performances of pieces from Éliane Radigue's recent OCCAM OCEAN series. Applying the lessons of her pioneering electronic work to acoustic music, Radigue investigates the textural and tonal possibilities of sustained notes. The four instrumentalists – cellist Charles Curtis, bassoonist Dafne Vincente-Sandoval, harpist Rhodri Davies and tuba player Robin Hayward – handle this highly demanding music with supreme control and subtlety, allowing the smallest gestures to take on great significance. Curtis is particularly compelling to watch, elegantly running a finger down his bow to cancel any vibrato, while Vincente-Sandoval impresses with her ability to coax high, pinched tones from her bassoon using circular breathing and a variety of reeds. The final piece ends with a short moment of twinkling strings from cello and harp, a quietly thrilling leap out of the drone. Lulled into a meditative state by Radigue's pieces, I'm soon roused into alterness by the second Brötzmann set of the weekend, this time in a duet with pedal steel guitarist Heather Leigh. Run through canyons of distortion and reverb, her instrument becomes a conduit of pure electricity, which she shapes into vast trembling chords and high tension squalls. Brötzmann smoulders on tenor saxophone, his full-bodied blues sonorities perfectly balanced against the terrible beauty of Heather Leigh's guitar. BBC SSO's first concert presents five world premieres, the highlights of which are Christopher Trapani's Rust and Stardust and Cassandra Miller's Cello Concerto. The former teems with with percussive colour, with several gongs being played simultaneously. The latter is a clever inversion of the concerto form, with Charles Curtis holding down a two chord figure while the orchestra moves around him. Curtis's cello falls away in the final stretch, leading to an overly-lengthy repetition of the sighing chords by the full orchestra. The cadenza, however, is a delight, with Curtis playing gliding harmonics over a deep cello chords. Over at the Fruitmarket Joel Stern triggers synths with lights, sending deranged tones fleeing around the four huge speakers positioned around the room. Mariam Rezaei returns for a duet with Hungarian vocalist Attila Csihar, laying turntable drones underneath his repertoire of ghoulish black metal rasps, Orthodox hymns and guttural throat singing. Sunday opens with Hild Sofie Tafjord's Mural, an extraordinary piece for a large brass band. A legion of players drawn from BBC SSO and local community bands snake around the Fruitmarket, creating a shifting wave of sound. It's followed by one of the most playful sets of the weekend, as Edinburgh's Hockyfrilla engage in a tug-of-war with tennis rackets hooked up to some kind of noise box, before joining Fluxus artist Ben Patterson and Rhodri Davies for a delightful participatory piece. Patterson reads out facts about the lives and deaths of famous historical figures, punctuating each announcement with noise making on a variety of objects. The audience is invited to join in by making merry with a pile of newspapers. A group of kids go wild, creating an avalanche of torn paper, while Patterson toots on a harmonica and Hockyfrilla's Dora Doll trills operatically to Bing Crosby's 'White Christmas'. The SSO's second concert opens with Peter Ablinger's Quartz, a tense, mildly nagging piece where expressionist strings jab against the ticking of an amplified clock. Enno Poppe's Altbau is lusher, with some colourful horn fanfares, while Christopher Fox's Topophony lays out a dreamy orchestra bed for Rhodri Davies' delicate harp improvisations. Last year's Tectonics closed with a piece by Richard Youngs, inaugurating a tradition whereby local experimental musicians are given their first orchestral commisions. This year Daniel Padden takes up the challenge, writing for a group which augments members of the BBC SSO with his comrades from One Ensemble and a troupe of wine glass players. The familiar Padden elements of Eastern European folk and Henry Cow-style art-rock are given an orchestral polish, with the improvisatory flourishes of cellist Peter Nicholson and the shimmer of the glass harp channelling the anarchic spirit of his regular groups. Tectonics Glasgow is a glittering festival of new music, curated by the BBC Scottish Symphony Orchestra's redoubtable Principal Guest Conductor Ilan Volkov.